The global fluid management market is projected to reach over US$ 64 Bn by 2025, with a cumulative annual growth rate (CAGR) of over 5.3% from 2017 to 2025, according to a new report published by Transparency Market Research (TMR) titled ‘Global Fluid Management Market – Global Industry Analysis, Size, Share, Growth, Trends, and Forecast, 2017–2025.’ North America is expected to continue to be at the forefront of global demand, with the market in the region anticipated to expand at over 4% during the forecast period. This is due to increase in the incidence and prevalence of infectious and lifestyle diseases, rise in the number of end-stage renal disease (ESRD) patients, and rise in prevalence of diabetes and hypertension, driving demand for dialysis treatment. The report offers detailed segmentation of the global fluid management market based on product, application, and end-user. The infusion therapy products segment is estimated to hold leading market share in 2017 and is anticipated to expand steadily during the forecast period. The infusion therapy segment includes infusion devices such as infusion pumps and infusion systems; IV access devices such as accessories and disposables such as administration sets; and IV solutions and products such as frozen & liquid premixed medications, empty containers for compounding, and IV solutions. The renal product segment, which predominantly includes dialysis products, is expected to expand at a significant CAGR during the forecast period, owing to rise in prevalence of end-stage renal diseases and increase in number of dialysis centers worldwide. For instance, according to the National Kidney Foundation, more than 2.0 million people undergo treatment for dialysis or kidney transplantation to stay alive across the world. The home care settings segment of the global fluid management market is expected to expand at a rapid pace during the forecast period owing to increase in research and development activities for the launch of products suitable for home care settings, rise in patient preference for home-based treatments, and lowest cost of the treatments performed at home as compared to hospitals or dialysis centers. For instance, Baxter, a leading player in the global fluid management market is focusing on new product developments suitable for home hemodialysis. In terms of value, North America is likely to continue its dominance in the global fluid management market throughout the forecast period, owing to a high incidence rate of chronic kidney diseases in the region, high adoption of dialysis procedures, rise in new product launches, and the rise in per capita health care spending in the region. For instance, according to national Institute of Diabetes and Kidney Diseases, in 2016, more than 661,000 Americans were suffering from chronic kidney failure, among these, 468,000 individuals were on dialysis and around 193,000 underwent kidney transplant. Europe is a prominent region of the global fluid management market, owing to the presence of a large number of pharmaceutical and medical device companies and increasing prevalence of lifestyle diseases such as obesity, diabetes, end-stage renal diseases, high blood pressure, and cancer among the population. Asia Pacific is an emerging region of the fluid management market and is expected to expand at a rapid CAGR during the forecast perios, owing to a rapidly expanding health care industry; growing economy; and rise in prevalence of infectious and lifestyle diseases such as cardiac disorders, kidney diseases, and others, which are fuelling demand for infusion, dialysis, and endoscopic surgery treatments. For instance, according to a report by LifeSciences Industry Research, by 2020, the global ESRD patients receiving hemodialysis treatment is expected to reach 4.2 million, out of which 1 million patients are likely to to be from China. The fluid management market in Latin America and Middle East & Africa is expected to expand at a rapid pace owing to expansion in economies of countries in the regions, rise in disease prevalence, increase in urbanization, rise in adoption of novel medical technologies, changing lifestyles, and increase in health care awareness among the population of the regions. Major players operating in the global fluid management market include Baxter, Fresenius SE & Co. KGaA, Nikkiso, Co., Ltd., C.R. Bard, Inc., Olympus Corporation, Ecolab Inc., Medtronic, Zimmer Biomet, BD, Smith & Nephew, Hospira, Inc., Animas Corporation, B. Braun Holding GmbH & Co. KG, Cardinal Health Inc., Stryker, Boston Scientific Corporation, Karl Storz GmbH, Richard Wolf GmBH, Asahi Kasei Medical Co. Ltd., Coloplast Group, and NIPRO Medical Corporation. 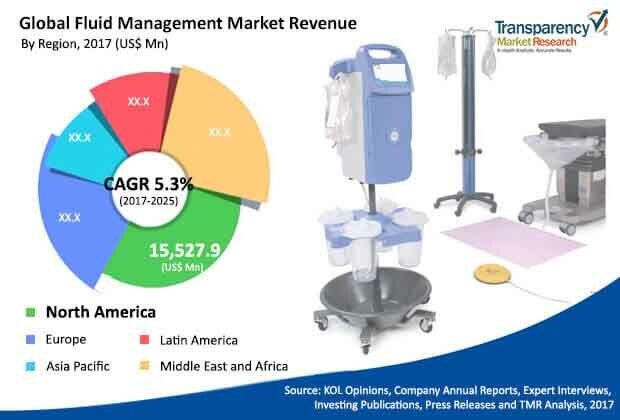 Other prominent players in the global fluid management market include AngioDynamics, Promed Group Co., Ltd, ICU Medical, Inc., CONTEC MEDICAL SYSTEMS CO.,LTD, SWS Hemodialysis Care Co.,Ltd., Dialifegroup.com, and Medica S.p.A. Leading players in the market are focusing on the service portfolio and geographic reach with the help of mergers and acquisitions, partnerships, and new products launches.